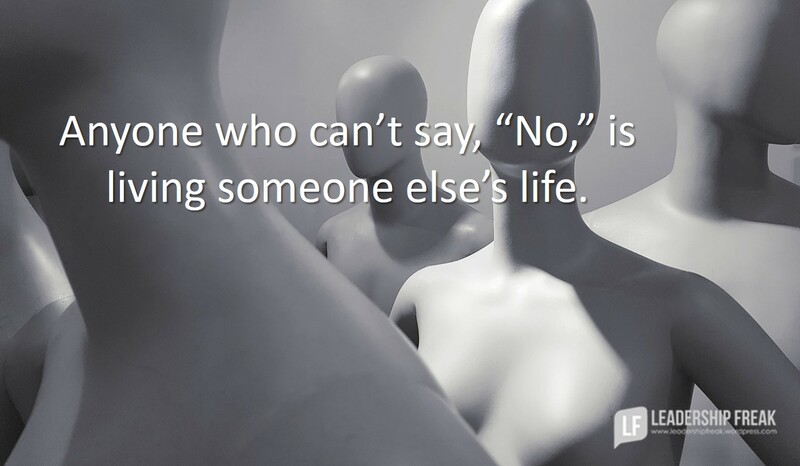 Anyone who can’t say, “No,” is living someone else’s life. Dis-empowered people. Fear says, “Yes,” when it should say, “No.” This may be one reason leaders hoard power, rather than giving it. People-pleasers. Our need for approval drives us into self-defeating activities and commitments. Dreamers. Do you love new ideas? Dreamers believe they can make nearly any idea work. Lack of focus drives dreamers to distraction. Ambitious people. Saying, “Yes,” earns opportunities – as long as you deliver on your yeses. Know your strengths, weaknesses, values, mission, and aspirations in order to set yourself up for success. Note: Don’t use self-awareness as an excuse to play it safe. Expressions like, “That’s just not me,” may be a smokescreen for fear, love of ease, or self-indulgence. Letting go of one project or responsibility has meaning when it’s an expression of saying, “Yes,” to compelling mission. Commit yourself to a noble path so you can turn from all others. Unreliable team members are like chewing gravel. Slacker-teammates double stress and strangle progress. First, you have to do your own work. Second, you live with the constant dripping of potential disappointment. One slacker stalls the entire team. Everyone waits when one person doesn’t follow through. Choose activities that best take you where you want to go with the middle-term in view. Short-term is short-sighted. Long-term has little urgency. Reject activities that seem like distractions. 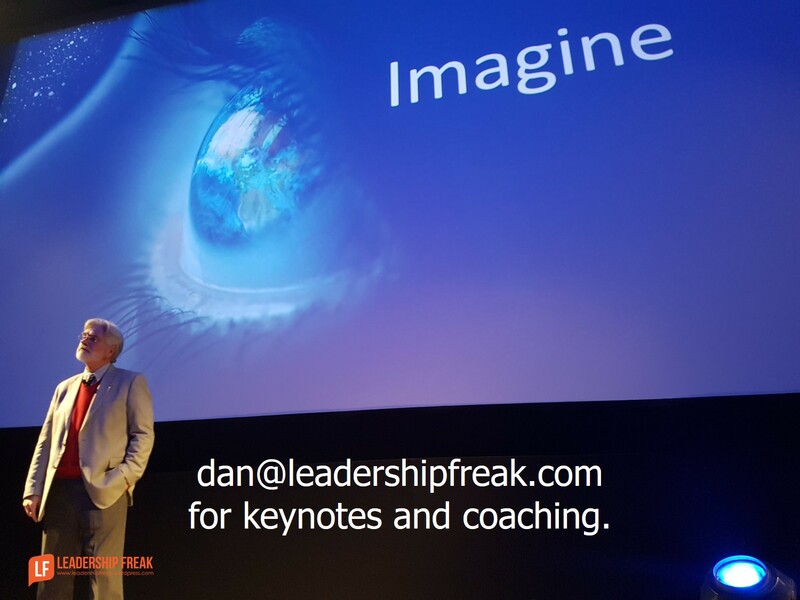 Does saying, “Yes,” deliver value to others and yourself? How does saying, “Yes,” express mission and aspiration? What strengths do you possess that provide confidence you will succeed? How might leaders say, “No,” with wisdom and grace? I had a boss that did just the opposite for the same reasons. She would say NO before you got done asking. It was her fear to lose any control and wanted everything to stay the way it was. She didn’t last very long. I felt bad when the team turned on her and management didn’t support her. Thanks Walt. It seems like there are two sides to every topic. “No” only helps us. “No” without “Yes” produces a disappointing unfulfilling life. In the end, it seems that “NO” people go nowhere. Dan as a young financial staff guy in our private company I initially felt the need to say yes to try to serve the older operating people. One day one of the most demanding people told me that I had a problem-I could not say No! From then on I looked at this in a much healthier and useful light. Saying Yes all the time delutes your efforts and does not benefit the larger good or your organization. Thanks Brad. I’m glad you added your story. It’s great that a demanding person brought up the subject. Unfortunately there are some bosses who surround themselves with yes people who say yes out of fear of losing their job.Those who do say no either find themselves out of a job, demoted or bullied. These are not leaders you want to work for. Exemplary leaders allow their people to say no without fear. Thanks Carolyn. You got me thinking about middle ground between YES and NO. I don’t think it’s maybe. I thing it has something to do designing a third alternative. ?? It might be good to remember that any request that you can’t reject is not a request. It’s a demand. I have learned that saying no requires maturity in leading self and others through a much broader skill set. We must manage our relationships constructively while saying no. That requires navigating with healthy boundaries. It requires negotiating skills, and setting priorities, which means that we must know what we want, who we are, and what’s important. It also requires courage and diplomacy. What can be so frustrating is when Sr. leaders reward these negative behavior patterns. I also see this a lot in non profit orgs who are looking to recruit volunteers. They want short term success so they reinforce these negative behavior patterns to get these people pleasers to step up. These leaders want to be chased for approval ( to get things done) by people pleasers who do it for the external validation but may become so overextended that it produces mediocre results and burn out at best. This lack of integrity can permeate an entire culture. It comes from an exploitative quick fix mentality that trickles down from the top. Imagine mentoring people to make wise choices and decisions, and to learn the art of saying no while managing boundaries to create a much more effective and healthier environment for the long run. It really boils down to investing in self and others to produce healthy behavior patterns that translates in to higher quality relationships, higher performance, and healthier organizations. Learning to say no actually brings more value to those we value and serve so that we bring ourselves with quality and integrity to what matters most. Great 3 questions, Dan! We must learn to proactively think in the place of mere reactivity. Thanks Carol. You sure added tons of insight. Your organizational perspective expands the topic. Learning to nurture and manage relationships hadn’t crossed my mind. But, after reading your comment, it seems essential. Great add! Under the heading Self Awareness…”Note: Don’t use self-awareness as an excuse to play it safe. Expressions like, “That’s just not me,” may be a smokescreen for fear, love of ease, or self-indulgence”. I am so pleased to see your thoughts. I have found that some self awareness is a result of a new/vouge self assessment tool that assigns a label to the person. That label then becomes a crutch to justify less than ideal behavior. The label can box people into a perception of themsleves and of others that have been labelled. I am “x” so you can not expect “y”. You are “x” and therefore in capable of “y”. There are feelers and thinkers (evidence, study, outcomes). We should not expect feelers to try thinking and we can also speak to thinkers as if they have no feelings. I would speculate that as an effective leader, everyone must be expected to adapt to anything at some point. Not all at once, but at least once. Thanks Will. Your insights bring clarity to something that’s been bothering me for awhile. It just feels indulgent to use authenticity and self-awareness as a reason to avoid challenges. Your word “crutch” rings for me. In a world dominated by yes and no it’s hard to see that sometimes the answer is Thursday.